Alright, everyone, San Diego Comic Con is next week July 19-23 and I have all kinds of new things for you! I cannot wait to go down there and put these things into everyone’s hands and see your faces!I will be residing at booth #2643 with Gallery Nucleus as usual. Special Release at the bottom of this post!! Special Release: In addition to the items I will have at my table (#2643) there will be a separate special release of my very first limited edition TOY. I have waited all my life for this moment. And if you look closely you will discover that Slimer is GLOW IN THE DARK. So great. There will only be 50 of these signed and numbered at the DKE booth #5045. So prep yourselves. It’s time for another HOUSE PARTY at Mondo Gallery in Austin, TX! Show opens this Friday March 17th! Everything will be $200. A wonderful group of talented buddies. GO to the show if you are in Austin or contact the gallery to see the artwork on your COMPUTER! But go to that show and send me pictures! i wish i could be there. Stormtrooping APs go on Sale Thursday! Hey, so do you guys remember the Stormtooping piece I did for the Art Awakens show at Gallery 1988? 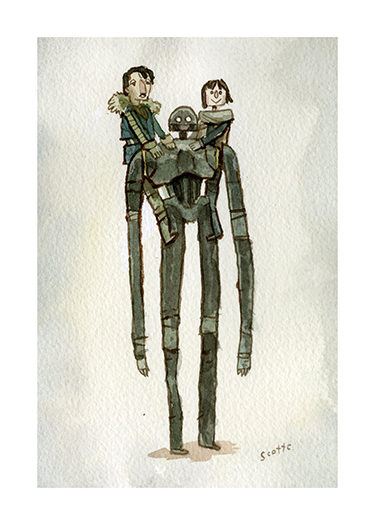 Well, they made prints of that thing and it sold out fairly quickly. BUT I do finally have a very small amount of AP prints that will go on sale in the Scott C Shop this Thursday at 3pm EST! They will be $100 each (limit 1 per person)! So go over and get one if you can! I’m sorry i do not have more of them. Thanks, everyone! My piece for the upcoming Art Awakens Star Wars exhibition happening in Los Angeles this weekend at Gallery 1988! It’s an auction this time! You can bid on this jammer this weekend! Bid on it!